Royal Arch Masonry (also known as “Capitular Masonry”) is the first part of the York Rite system of Masonic degrees. Royal Arch Masons meet as a Chapter, and the Royal Arch Chapter confers four degrees: Mark Master Mason, Past Master, Most Excellent Master, and Royal Arch Mason. Royal Arch takes its membership from Blue Lodges. The degree of the Holy Royal Arch is of great antiquity, and has a special importance in many masonic systems, including those of all three of the oldest ‘Constitutions’ (masonic authorities), namely the Grand Lodges of England, Scotland, and Ireland, in all of which it is considered (by varying constitutional definitions) to be the completion of the mainstream masonic structure. A Royal Arch Chapter is in many ways the same as a Lodge; it has officers and a ritual degree system, which consists of four degrees: Mark Master Mason, Past Master, Most Excellent Master, and Royal Arch Mason. During the colonial period Fredericksburg Lodge in Virginia lists a conferral of the Royal Arch degree on December 22, 1753. There is also a Royal Arch Chapter noted in 1769 in Massachusetts (St. Andrew’s Royal Arch Chapter in Boston. Through a report compiled by the Committee on History and Research appointed by the Grand Chapter of Massachusetts in 1953 and 1954, it was found that St. Andrew’s Royal Arch Chapter was the oldest Chapter in the Western Hemisphere by date of constitution, having been officially constituted April 9, 1769, though the records implied that the Chapter had been working prior to that date, and perhaps as early as 1762. The report also states that it is unknown whether the Fredericksburg Lodge in Virginia conferred only the Royal Arch degree or the entire series of degrees. Pennsylvania, however, claims to have the oldest extant Royal Arch Chapter in the world. Royal Arch Chapter No. 3 (formerly Jerusalem Royal Arch Chapter No. 3, and before that Royal Arch Lodge No. 3) has complete minutes going back as far as December 3, 1767. This Chapter began meeting under the authority of the Grand Lodge of England (Ancients) and it is believed that the Chapter was constituted around 1758, but this date has yet to be proven. It currently works under a renewed warrant from 1780.The Grand Chapter of Pennsylvania claims to be the first Royal Arch Grand Chapter in North America and was formed on November 23, 1795 by the Grand Lodge of Pennsylvania. 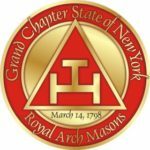 In 1797, a group of Royal Arch masons met in Hartford, Connecticut to try to establish some sort of governing body for degrees that were largely conferred in the New England states, which became the Grand Chapter of the Northern States, and later was broken down into the state-by-state Grand Chapter system. This body later became the General Grand Chapter, Royal Arch Masons International.